You know it's going to be a good day when your in-box holds an early morning email with photos attached from Vince Lamb. 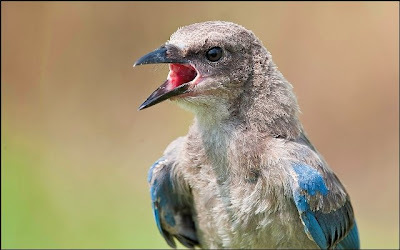 Vince is a scrub-jay expert, skilled nature photographer, Florida Naturalist, volunteer extraordinaire, and a nice guy! In response to an out-of-state friend's question, I'd asked Vince about the best time to observe our scrub-jays. He sent the following reply, accompanied by the two photos you see here. Florida scrub-jays are great any time of year. From May until September, the juveniles are detectable by the brown heads, although that effect fades by September. Some breeding behavior like sharing food can be observed in March and April. Scrub-jays are hard to find when it is windy or rainy. They do not start feeding until approximately 30 minutes after sunrise and find a roosting place for the night a half hour before sunset. They seem to take a siesta around noon in the heat of the day. Many of the seasonal differences are more important to people than the jays. Hiking in Florida scrub is nicer in late October than mid July. 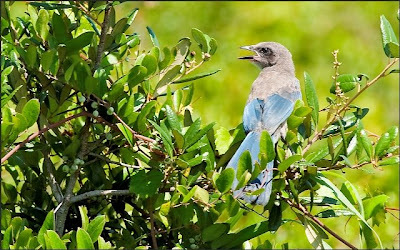 Cruickshank Sanctuary in Rockledge is a good place to spot a friendly scrub-jay. You can read more about the Sanctuary in the March 3 post on my Space Coast Eco blog. Don't these pictures bring a smile to your face? Many thanks to Vince for sharing. Be sure to visit his photo web site - see Reference Links below. I guess a little retrospection is OK, so about 10:58 tonight, I'll be thinking of those "good old days." 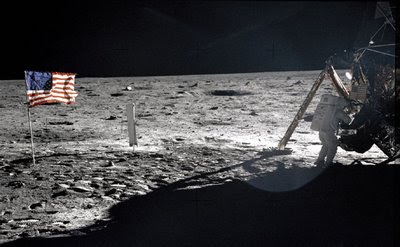 Great images and thanks for the info! Look forward to seeing these birds. Liftoff - the Sixth Time Is the Charm!